In the previous post, we discussed how the center diamond is the starting point & key the rest of the layout. So it was logical to start with building the 14 degree crossings. I needed to build 4 of them to form the diamond. As you can see above, I have built 4 of them. Before I could build the crossings, I needed to gain some experience using the fast tracks jigs. In a previous post: And so it begins..... I describe building the #8 turnouts which were the first production pieces I built for the layout. In all, I built 5ea #8 Turnouts. For each one I built, I gained experience with switch construction & the challenges that go with it. If I had to do this totally from scratch, I would likely have never attempted someone of this scale. I would have simply ordered pre-built switches and worked at trying to modify them. I am very familiar with the excellent instruction set (and video!) that came with #8 Turnout. However, I was very disappointed with the instruction manaul for the Crossings. The instructions were short (6 pages) and not very well done. The instructions did not go into any real detail on how to build the crossing other than the basics. Note: the crossings jigs do not come in a kit form like the turnouts. You need to buy the fixture & point grinding tool separately. I find this kind of odd as it would be very difficult to make the crossings without the point tool. Also, the point tool is unique for the crossing you are building. There is no "generic" point tool for the crossings. I built the 1st crossing using the Fast Tracks instructions. I always use the first-built piece to study where I possibly went wrong & how I can improve construction. I have to say, the first crossing I built was a mess as I tried to follow the instructions to the letter. My lack of experience & weak instructions made for a bad build. Until the instructions improve I would not want this to be my very first attempt @ building any Fast Tracks product. If you are new to Fast Tracks & have never built any of their kits, I would highly recommend you start with a turnout or at-least read the turnout instructions & watch the video. I wish Fast Tracks would have a video of every one of their kits. Watching someone build what you are trying to build for the very first time is much easier in my opinion. After looking @ the mess I built for the 1st crossing, I carefully re-examined what I did wrong, and figured out a much better approach to build the next 4 crossings. The first thing I learned is that the jig did have some burrs; especially in spots where the rail grooves bisected the tie grooves. I first noticed this when I had trouble getting the rail to seat properly when I placed them into their respective slots. I took a fine file and went through the entire jig cleaning all the grooves. I think the reason why there were burrs in the first place is likely that the cutting tools Fast Tracks used were probably worn-out when they made my jig (my #8 turnout was clean as a whistle). I did notify Fast Tracks of the issue I found so they would be aware of it happening. Note: I have 4 jigs from Fast Tracks & this was the only jig that had any burrs. The other 3 were clean & very well tooled. The second thing I learned about the crossing assembly, you do not need to insert the ties before you start construction. You can build the entire thing without the ties in-place.Of course, sooner-or-later you need to solder the rail to the ties but it is not essential to the structural integrity unlike some of the other jigs . I found it to be much easier to get all the rails in-place & soldered to each other as sub-assemblies then Solder the ties last. It helps keep the rails in-place much easier than sitting them on-top of the ties. It also greatly reduces the chance of accidentally rolling the rail. As I said above, after the 1st crossing disaster, I never looked @ the instructions again. I simply created my own instructions which worked just as well - at least for me. This is the hardest part of building the crossing. You need to cut, file, & shape 4 pieces of rail exactly the same in order for them to fit properly. It takes a lot of work to get everything to line-up properly. I ruined a couple of pieces of rail trying to get the fit correct (never throw mistakes or small pieces of rail away: you can always use the mistakes to make other pieces in other projects). Once you get everything all lined-up, solder it together . I did this by soldering the point frogs first for one half, then I built & soldered the other half. I would slowly nip & file the rail until the middle (obtuse) angles matches. One thing I should note about the point forming jig for this kit: there are 2 types of frog points available - The acute point & the obtuse point. What's the difference ? The acute point is the sharp angles on the left/right sides where as the obtuse angle is the shallow angles on the top/bottom of the crossing. This is a fairly easy step to cut and form the end frogs. Use the acute point part of your point grinding tool to form the frogs. This step goes pretty quick if you have the point grinding tool. Make two of them - one for each side. The wing rails are much more difficult to build than the frogs. The Fast Tracks instructions recommended that you build these out of individual parts & solder them together. This would mean you would have to cut & shape 3 pieces of rail per wing rail. 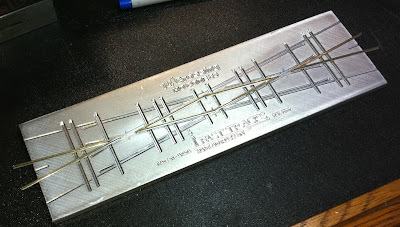 After building the first wing rail, I quickly learned that I set the frog point too shallow in the jig. This left a wide gap in the center of the crossing which could become a problem when used operationally. I used my trusty NMRA track Gauge to find where the points should be properly meeting in the jig. I found that the point should go to the edge the inside of the innermost tie in the jig. This makes the center frogs nice & tight as well as within the tolerances of the NMRA gauge. Once I found the right spot, it made it much easier to cut the rail & file to the proper length. After you make the points, you need to form the wing rail. Instead of cutting, fitting & trimming the rail, I took a cue from the turnout instructions by nipping the bottom web of the rail & bending instead of making a separate piece. As I was trying to figure out exactly where to bend the rail, I noticed that Fast Tracks forgot to include the guide mark on my jig so you know exactly where to either cut or bend the rail. I placed the center guardrail & frog back into the jig so I could once again use my trusty NMRA gauge to figure out where the cut/bend point should be. Once I found the bend/cut point on the jig, I made a mark using a Sharpie pen so I would have no trouble making the rest of the sets. I then nipped the rail & bent it to follow the groove. After bending I trimmed the rail to length & bent the end so that it fit completely in the jig as you can see in the above photo. I then placed the outer guard rail back its slot & soldered the points together. Once the solder cooled, I popped it out of the jig, flipped it over and put it back into the jig on the opposite side. I made another mark with a Sharpie pen so I would know where to bend the rail for this side of the jig. Using the same technique for the first wing rail, I proceeded to make 3 more just like it. As the wing rails are exactly the same for all 4 sides, it was a simple task of cutting 8 pieces of stock rail for to the proper length to make the 4 wing rails. I cut all of these plus 2 more pieces to act as master patterns for the other 3 crossings I need to make for this project. Once the 4 wing rails are finished, be sure to gently file the top-inside ends of each end of the wing rails so that it helps guide the wheels into the onto the rail & not on top of the rail - that would be bad. Remove all of the finished rail from the jig. Cut the PC board ties to fit the slots. You might need to sand the ties on the edge to make the fit easier. Be sure to file notches on the top of each tie so the Copper Cladding on the ties does not cause a short on the finished crossing. 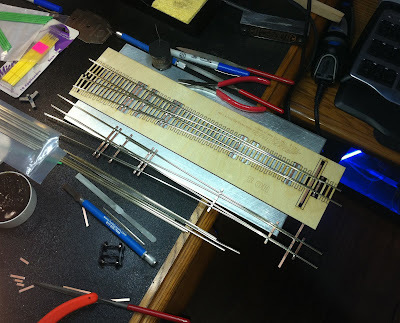 Once the ties are in-place, it is time to solder them to the rails. It is best to work from the middle out to the end of the jig. Be sure to note that wherever you solder, you will leave a slight raised area of solder. It is best to solder in areas where the rail is not too close together as the solder will interfere with securing the rail & keeping the entire assembly flat. Start with the center diamond. Solder the inside of the diamond to the ties. Next, insert the 4 wing rails into the jig. Solder the inside of the wing rails to the ties. Finally, insert & solder the outside stock rails. This time your solder points are on the outside instead of the inside of the assembly. Once everything is soldered together, pop the completed crossing out of the jig. Turn it over & solder underneath the frog points in order to re-enforce the points & prevent them from popping-up. Now that everything is complete, take a wire brush & clean the crossing. Gently brush the rails & solder points back & forth removing all the grime, solder flux, & leftover filings from the completed crossing. 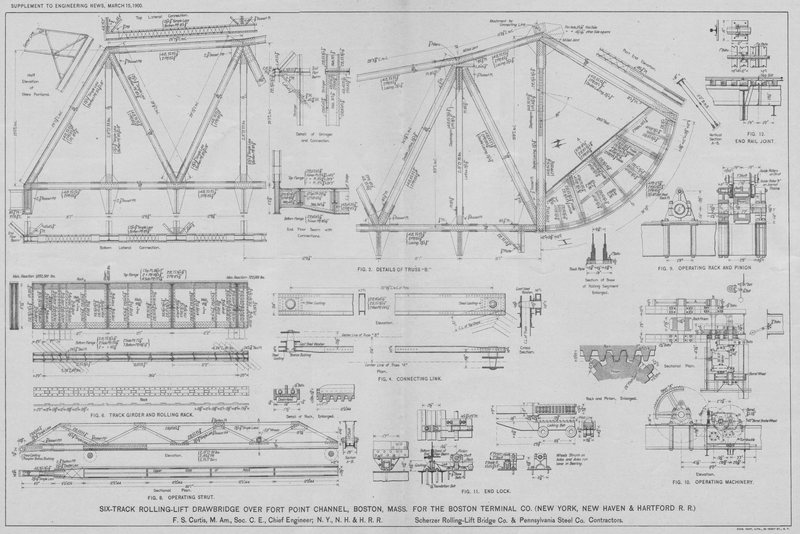 This is the HO scale drawing of the center diamond. The track centers are scaled out to be 1.75 inches apart. Why 1.75 inches you ask ? Because South Station didn't have the real-estate to make them any further apart. As the tracks transition into & through the yard, the spacing because tighter & tighter with the narrowest point through the #8 Double-slips & Center Diamond. The ends of each crossing will need to be modified so that I can carry the 1.75 inch spacing through the center diamond & into the #8 Double-slip switches. Once I print-out & insert the #8 Double-slip drawings, I will know exactly where to cut for electrical isolation of the frogs & the transition to the next piece of track/switch. For now, I will keep all 4 crossings stored-away until I build the benchwork for the layout. My next projects will be to begin construction of the #8 Double-slip Switches & Benchwork. I already have the #8 Double-slip switch jig from Fast Tracks. I am going to attempt to build the #8 Double-slips using a few new techniques. More on that in another posting similar to this one. The layout benchwork will begin as soon as I conjure-up some cash to by power tools so I can actually build the darn thing. When South Station was designed & built back in 1897 the purpose of the terminal was to consolidate 5 different railroads with their traffic, into 1 single facility. To do this required an enormous amount of planning & engineering that needs to take railroad traffic from 10 individual approach tracks and guide them to any one of the 28 station platforms safely & quickly. 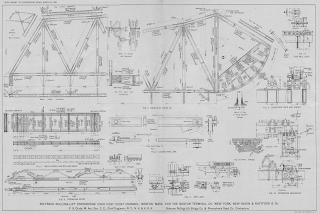 To accomplish this task, great care was taken to design the station's interlocking plant to be able to handle the enormous amount of trains that were expected to arrive & depart every day. 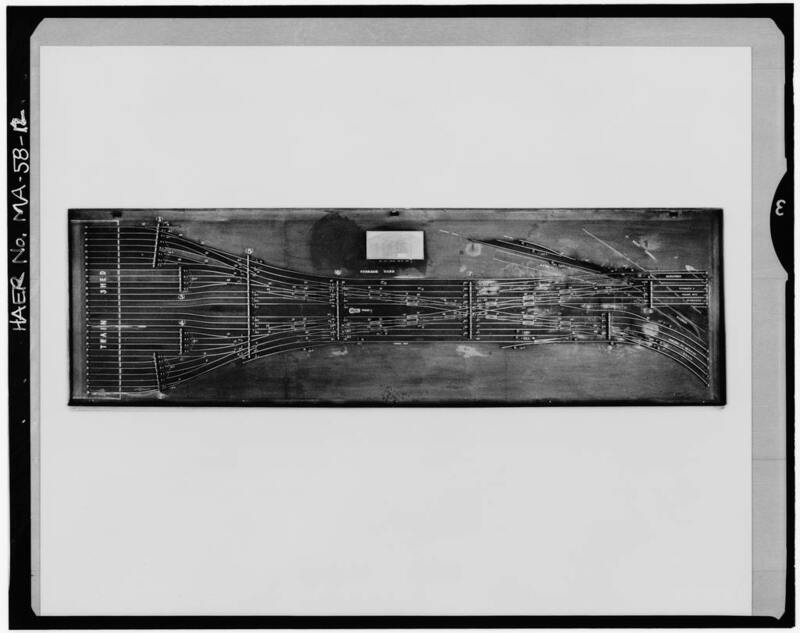 For a train to be able to reach the proper track when arriving or departing, a bewildering system of switches was built in order to move trains to the proper track without crashing into each other. Railroads use a system called Interlocking to control train movements through switches. Interlocking is an arrangement of signal apparatus that prevents conflicting movements through an arrangement of tracks such as junctions or crossings. The signaling appliances and tracks are sometimes collectively referred to as an interlocking plant. An interlocking is designed so that it is impossible to give clear signals to trains unless the route to be used is proved to be safe. When South Station was designed, the railroads were fully aware of the amount of traffic they were expecting to handle once the station was put in full operation. In the first year of operation, the station handled 737 trains daily. By 1913 the station handled 38 million passengers annually which was 16 million more that Grand Central Station in New York. In addition to scheduled trains, deadhead movements, car cleaning, etc. this involved about 2,500 movements through the terminal's interlocking plant daily in order to service this many passengers & trains. 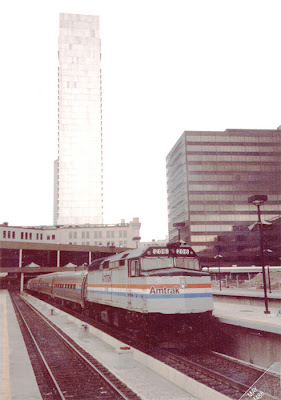 To solve the problem of moving upwards of 90 trains per hour, the South Station Terminal needed a large tower to be able handle the enormous traffic load. 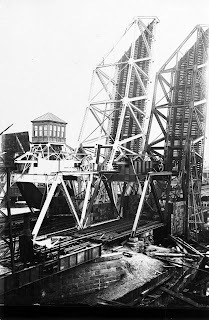 When the Terminal opened in 1899, there were actually 3 towers that handled all the traffic - Tower 1 (shown here) which controlled the main trackage, and tower 2 which handled the suburban lower loop trackage & interlocking. (Tower 2 was never put into full service as it only handled the underground loop -which was only used only once officially.) Tower 3 was located on the curve just past the Fort Point Channel Bridges. This Tower handled switches at the yard limit for both the NYC and NH approaches. At the time of the station's construction, the primary method of controlling the movement of the switches was through the use of mechanical levers. This involved a person, located in the tower, to physically pull a large lever mounted to the floor. The lever was attached to system of mechanical linkages to a pipe that ran from the tower to the switch that needed to be thrown. It was all very complex to operate & maintain since all the mechanical linkages tended to jam or would freeze-up during cold weather. It also required a large crew of very strong men to be able to push & pull the levers day-after-day. If a Mechanical Interlocking plant were to be installed at South Station, it would require a tower 160ft long with 360 levers & 45 feet of space on each side of the tower to accommodate the load out piping that ran from the tower to each switch - all 130 of them. Space being a premium where the station was being built, another solution needed to be found. After much consideration, the engineers selected the Westinghouse electro-pneumatic interlocking system that was recently invented. 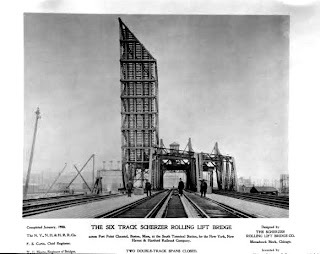 It was a very logical choice as it required 1/3rd the amount of levers, fewer men to maintain & operate, and most importantly, a smaller tower which could be located in the middle of the station trackage for the best view of the switches & signals. The entire system was not operational when the station opened in December 1898 so a temporary shack was built until Tower 1 was completed. 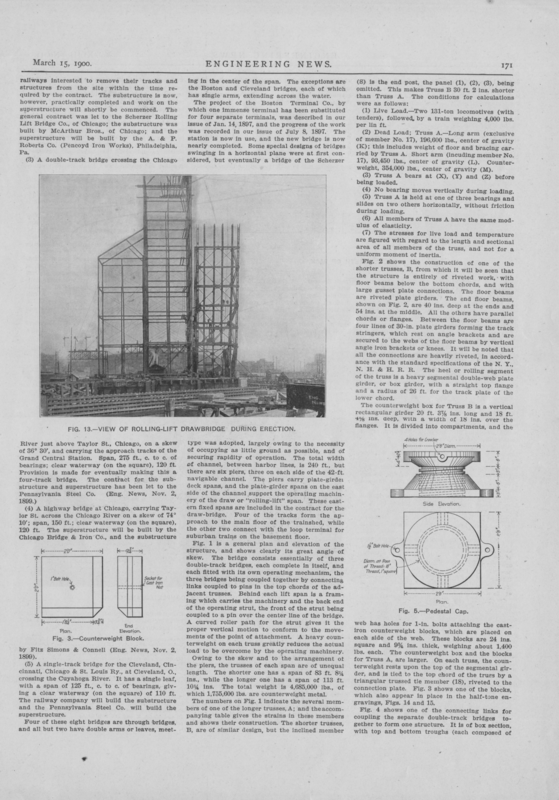 On May 7, 1899 Tower 1 & its Model 14 Electro-Pneumatic machine became fully operational. Tower 1 is a 3-story brick structure with a Slate roof and sits in the middle of the track complex. On the first floor of the structure are switch relay cases. The second floor contains the Tower's generating system that converts AC power to DC for use by the machine. The third floor is encircled by windows allowaing a clear view of all track approaches. The Switch machine itself has 143 levers - 130 operational & 13 spares. 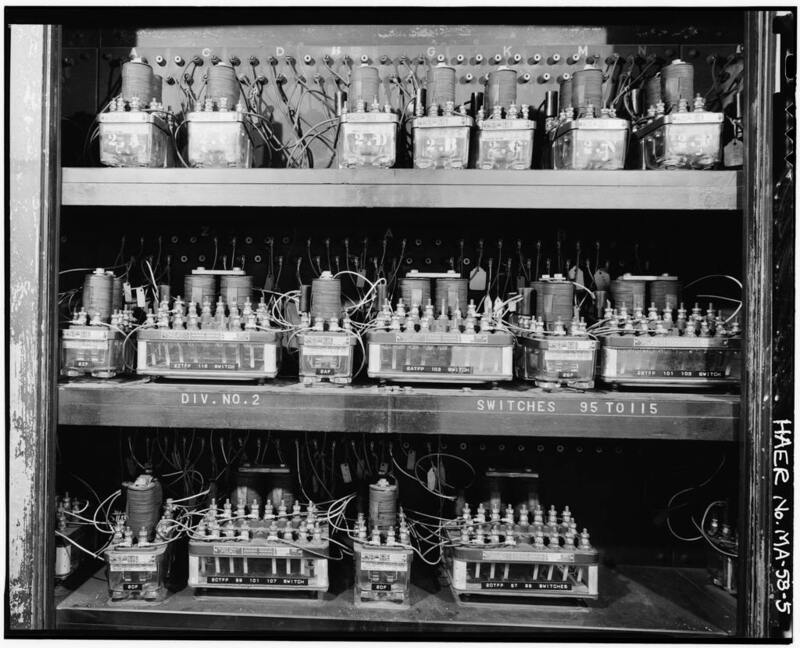 These in-turn operated 91 High Home Signals, 36 Cautionary Signals, 21 Dwarf Signals, 31 Double Slip Switches, 31 Movable frogs, & 40 Single turnouts. All together this means the switch machine can handle 148 Signals & the equivalent of 233 switches. The levers that control Switches are painted blue, the signal levers are painted red, and the spare levers are painted white. 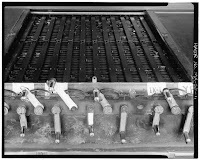 Above the machine is a model board operated by minuture mechanical linkages which are mounted on the rear of the board & driven from connections to the switch levers. There are miniature working Semaphores at the top of the model board. 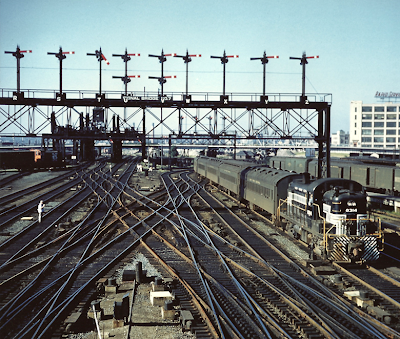 A leverman could move a lever, see the actual Semaphore in the Yard change position, and then see the arm of the model Semaphore move to reflect the new position. At the North end (Head end) of the Tower are other indicators which show signal positions. 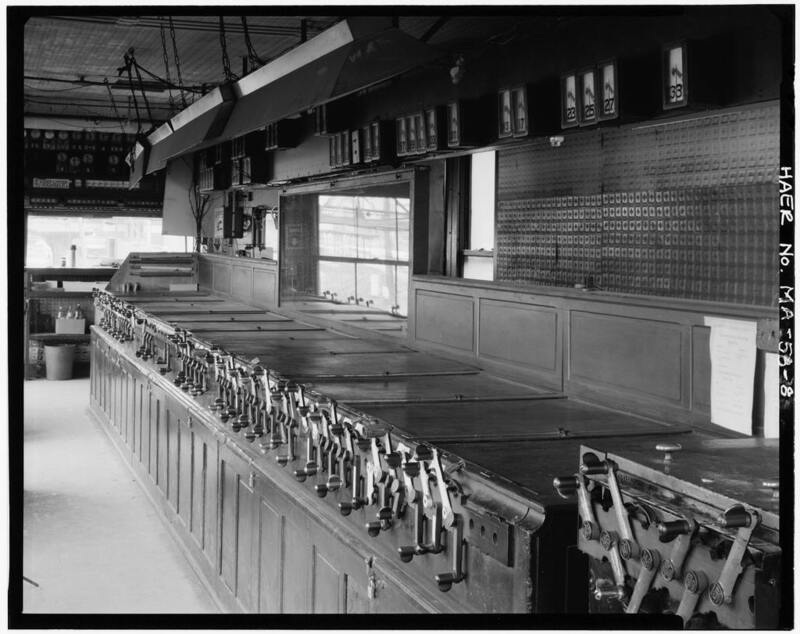 Tower 2 was built to control switches & signals on the Suburban loop track. 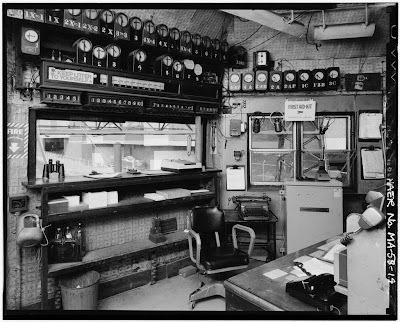 This tower (a small 1-story structure located at the tunnel opening to the underground loop) contained a switch machine with a 11-lever Electo-Pneumatic machine operating 8 dwarf Signals, 4 double-slip switches, 4 pairs of movable frogs, and 28 single switches. Tower 3 was located at the far end of the yard just beyond the Fort Point Channel bridges. 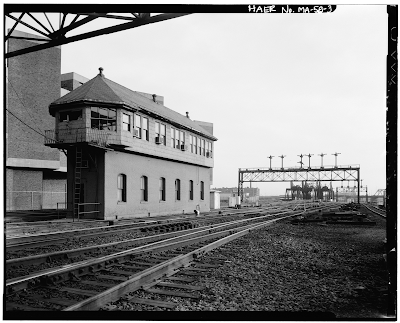 This Tower also had 11 levers that controlled the approaches to the Loop Track as well as the main line approach tracks to South Station for the New Haven & New York Central Railroads. 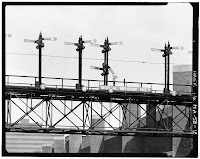 To provide information to the locomotive engineers, the yard used 9 signal bridges to hold the various Semaphores which in-turn displayed if the switches were properly aligned by the Tower. 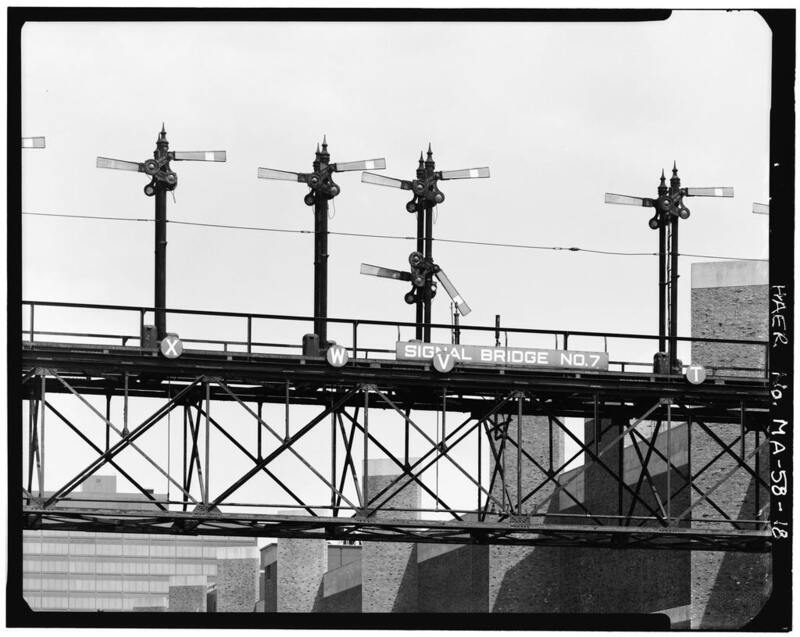 The Semaphore blades & lights adopted were in accordance with the system used by the New Haven Railroad. The New Haven having recently adopted a standardized system of colors used by the Signaling system: Red for Stop, Yellow for Caution, and Green for Proceed. (replacing white for proceed). This color code was adopted for use in the station's signals. Air cylinders were usd to move the signal arms & switches with Magnetic valves controlled by wires which extended to contacts of the interlocking machine. Two Ingersoll-Sargent air compressors in the power plant supplied the compressed air for the operation. One compressor always being held in-reserve as a relay to the other. 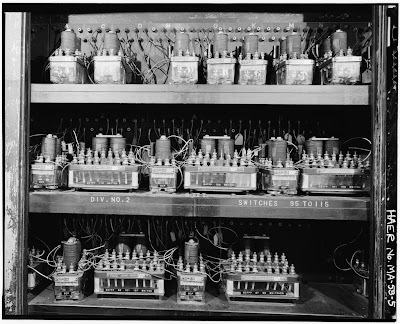 The air mains were duplicated so that failure in one line with not prevent immediate operation of the switches and signals through the other line. In the beginning of operations, oil lamps were used for the signal lights at the station with the exception of one signal bridge, where electric lights were tried on an experimental basis. Why experimental you ask ? because railroads were very conservative operations and something like electric lighting was still young in the minds of many in the railroading business. 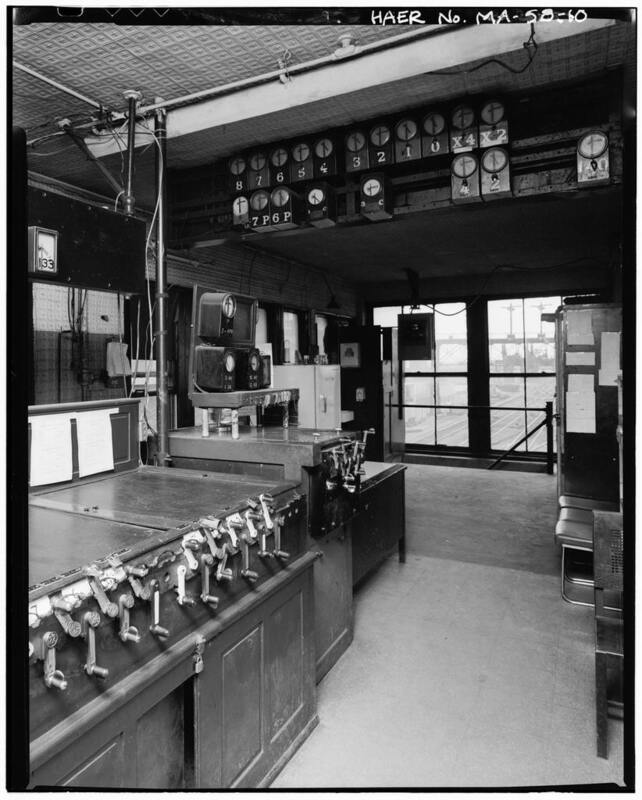 The "experiment" was likely as pretty good experiment in that by 1904, 182 electric signal lamps were in-use at the terminal. Rail circuits on the station tracks controlled the cautionary signals governing the approach of trains to the station and indicators within Tower 1. 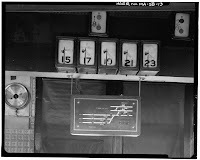 A set of 28 indicators (one for each station track) were activated by the rail circuits & showed the presence or absence of trains on the station tracks. 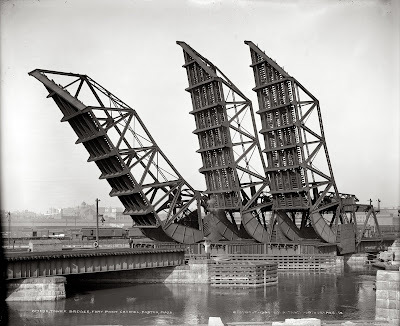 As built, the Tower was directed by a Interlocking Supervisor who, in-turn had an operating force consisting of: a directing dispatcher and his assistant, a telephone attendant, a telegraph operator, and 3 levermen all working on a 2-day shift. During the nighttime, the operating crew consisted of a dispatcher and 2 levermen. Mind you that on a typical operating day the huge amount of traffic generated approximately 28,450 lever movements per day. The arrangement of trackage allowed for one side to be used for incoming trains while the other side would handle outgoing trains. The weakest part of entire interlocking was the 4 sets of crossover tracks in the middle that allowed trains to access any station track from any direction. If a locomotive or worse, and entire train derailed in the middle of any of the crossovers, it could put anywhere from 50%-100% of the entire interlocking out of service until the tracks were cleared and declared fit for use. 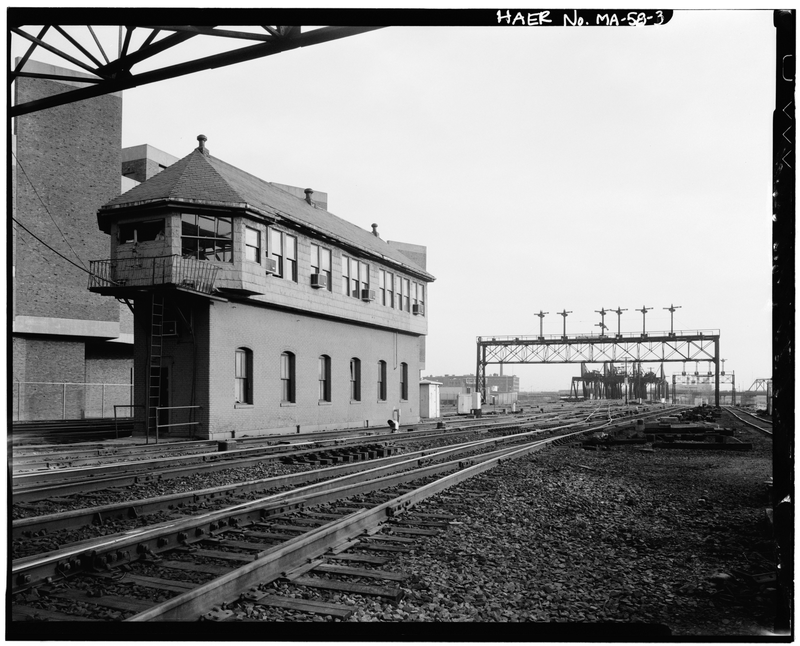 The Interlocking plant saw little change from the time it was built until the 1929-1931 upgrade of the station. 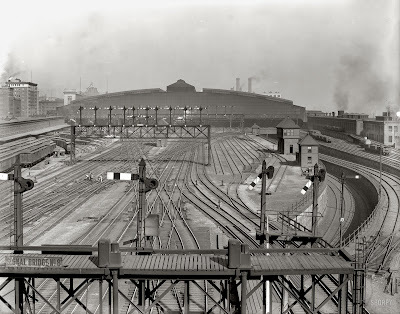 After the train shed was removed, the number of active use tracks were reduced from 28 to 17 with the decline of traffic during the great depression. 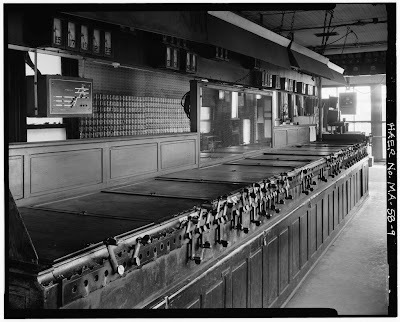 In 1934, the new U.S. Post Office was constructed over tracks 21 - 28 which were being used as storage tracks by this time. Also by 1934, with tracks 18-28 not in active service, the Semaphores were removed as they were no longer needed and the Signal bridges were cut back in order to reflect the cutback in service. Signal Bridges 1 & 3 were removed completely, Signal bridge 2 was reduced in size, & Signal bridge 5 was cut in-half. 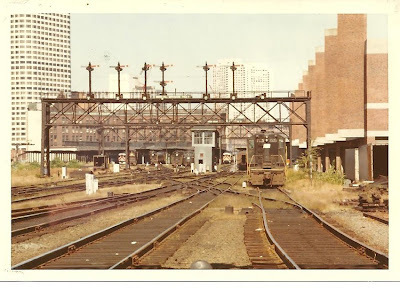 After the Boston Terminal Company (The operators of South Station) came out of bankruptcy in 1952 the operating plant consisted of 17 out of the 28 original platform tracks, the Loop track & half of the inside yard tracks either removed or out of service. The biggest blow to come to the terminal was when Commuter service was terminated on the New Haven in July 1959. These trains alone, made-up one-half of the volume of South Station. At this point, tracks 1-9 were declared out of service due to lack of trains to fill them. After 1959, Tower 2 was removed, never actually used in active service. 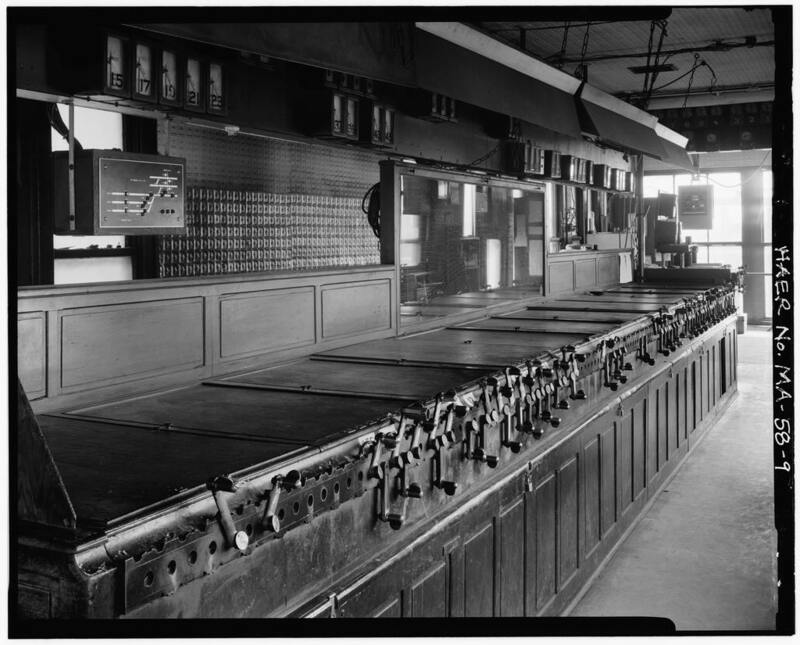 The U.S. Post office removed tracks 21 - 28 in order to expand their operation & facilities. The power plant & gas works were declared obsolete and demolished during this period. By the 1970s, only tracks 8 - 17 were in-service. In 1974, the Railway Express building was demolished & the express tracks removed. The U.S. Post office built several new buildings which permanently removed tracks 18-21. The New Haven (now Penn Central) removed 2 of the 6 approach tracks as they were no longer in-use. 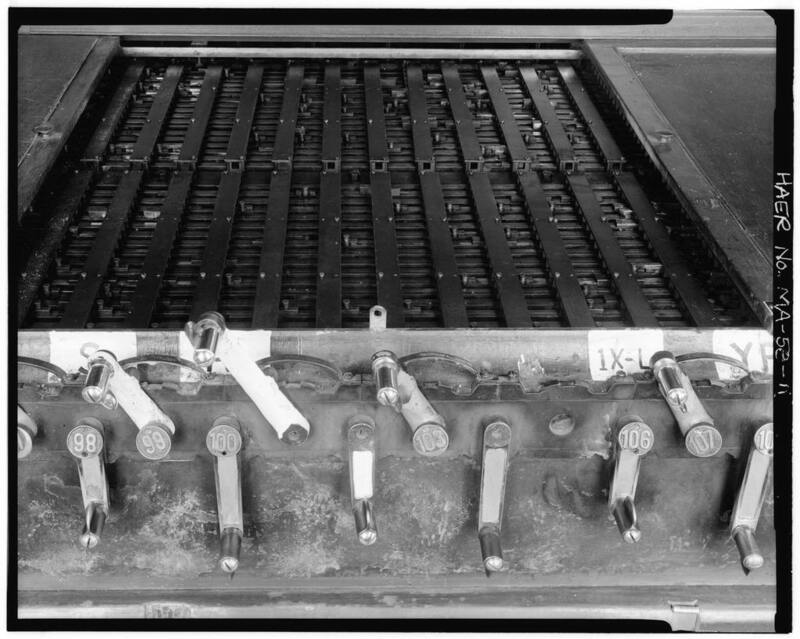 By 1977, only 57 of the Interlocking machine's original 143 levers were working, controlling 55 signals, 17 single switches, 18 double-slip switches, and 9 movable frogs. 55 of the unused levers were removed from the machine while others were reserved as spares. In addition to the original machine, a 7-lever Electro-Pneumatic machine built in 1939 was added to the tower in the late 1970s when Tower S.S. 237 (Tower 3) was demolished and the switches were now remotely controlled from Tower 1. 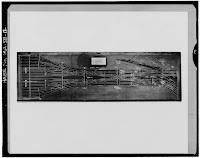 A new model board was installed next to the original one inside the tower to indicate track occupancy. 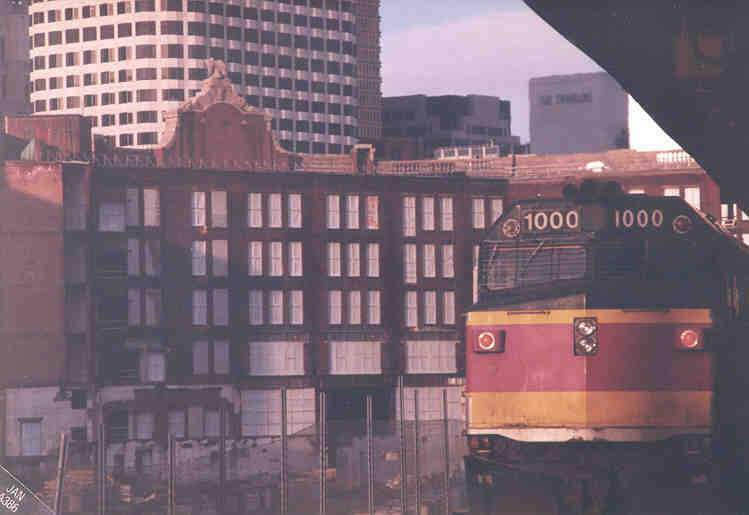 By the end of the 1970s, the Interlocking plant served 144 scheduled trains in & out of South Station. This traffic included 24 amtrak trains & 130 Commuter trains. When South Station was completely rebuilt starting in 1984, Tower 1 was finally demolished as the station, platforms, and trackage were completely rebuilt by the MBTA. 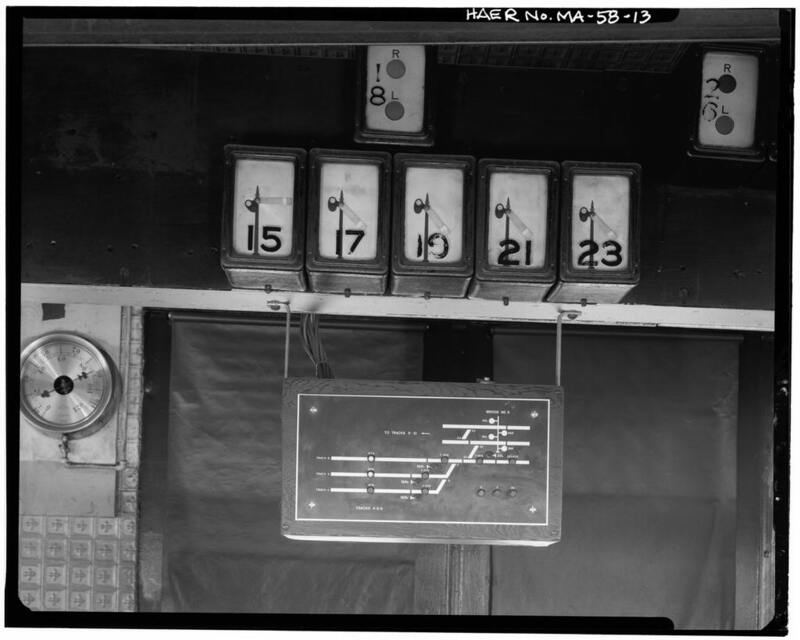 Today, there are 13 platform tracks currently in operation with the interlocking controlled remotely from inside South Station in the CETC (Centralized Electric & Traffic Control) Center. Images of Tower 1 from the late 1970s outside & inside. First Piece of HO Scale Hardware has arrived. The first piece of hardware for the South Station project has arrived. What is it you ask ? So, in my usual wreckless manner of thinking, I decided that in order to keep costs down, I would use the Fast Tracks Switch jigs. I would buy the jigs and build them myself. Simple Right ? John, Have I ever build a hand-laid switch before ? Well, not really. I have hand-spiked track before which was not too difficult to do once you got the hang of it. How hard could it be to advance to making hand-laid switches ? If there is one thing I am pretty good at is learning something completely new. Even though my real job is computer network engineering, I managed to teach myself how to design structures, ships, etc using 3D CAD software just because I found it interesting. I have learned if something really interests me, I tend to pick it up pretty quick. The folks at Fast Tracks took most of the hard work out of making hand-laid switches but creating jigs that you lay the rail and ties into. Then you solder the parts toegther to complete the switch. The end result is a nice-looking piece of track that you built at a very low cost. So, instead of paying $85.00 for the Double-slip switch, The cost is reduced down to about $15.00 plus your sweat equity. The incentive of reducing the cost of making all 34 switches from $2890.00 down to $510.00 is a huge incentive for me to learn how to build switches using the Fast Tracks Jigs. O.K. John, then why did you buy the #8 Turnout before you buy the #8 Double Slip? Well, building a #8 Turnout is considerably easier than building a #8 Double Slip switch. I need to learn technique on how these things go together and, most importantly, if I have the skill required to build these switches. Might as well start out easy, gain experience, then tackle the more difficult switches. By the time I build the stock switches, turnouts,etc, I should have enough experince in making hand-laid turnouts to be able to build a genuine custom-made switch. When the South Station Terminal was designed, consideration was given to having the entire facility, including station, midway, & facilities would be a self-contained Terminal. This means that the terminal could operate without depending on the City of Boston for power, Ice, & Gas for lighting. The buildings & passenger cars required heat during the winter months. Ice would be required for cars equipped with Ice Air-Conditioning, Power for Electric Light, and finally the Passenger Cars required Pinch Gas for providing Lighting as most cars in 1898 still used gaslights for interior lighting. The South Station Terminal Company would have to build these structures on-site & close to the trainshed & station they serviced. These buildings were constructed at the far end of the trainshed along the edge of track 28. A switchyard & coal tipple were built in order to bring coal in for the boilers. Tracks were added inside the Boiler plant to remove the fly ash. The Gas works were build at the far-end of the plant to create & store Pinch Gas. At the opposite end of the building, nearest to the trainshed, the Ice Plant was built to provide Ice for the Station & Passenger Cars that used Ice Air-Conditioning. The Generators for Electrical services were located in the Boiler Plant. Service Tunnels were constructed underneath the station to move Ice for the cars and run the piping & electrical services. One of the main uses of the Boiler Plant besides providing steam heat, was to generate electrical power for the entire Terminal Facility. The plant needed to provide power for Lighting, the massive exhaust fans for the underground loops, and most importantly, power for the the massive compressors that provided air to operate all 137 of the electro-pneumatic switches in the terminal zone. 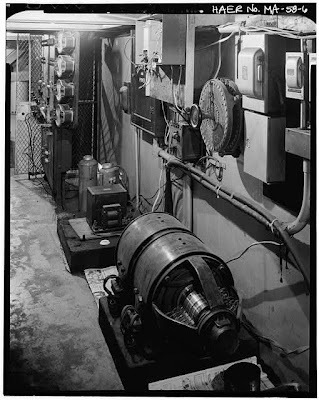 The power room also needed to provide power to the sump pumps for all of the underground portions of the Terminal. Since the terminal was built on a tidal flat, water was a problem for all the underground facilities in the terminal. Large pumps were constructed throughout the terminal to keep everything dry. For a detailed description of all these facilities, The American Society of Mechanical Engineers published a journal on the facilities. 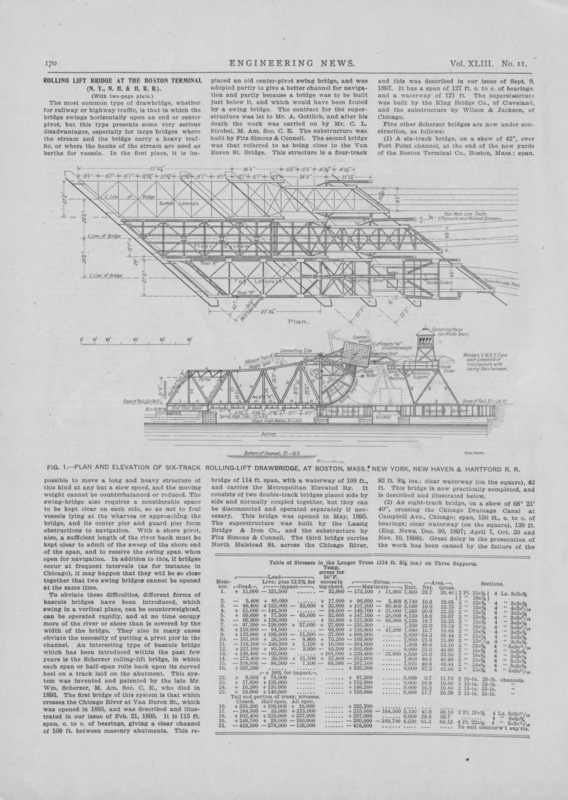 The South Station mechanical facilities are extensively covered in Volume XXI of the Transactions of the American Society of Mechanical Engineers. 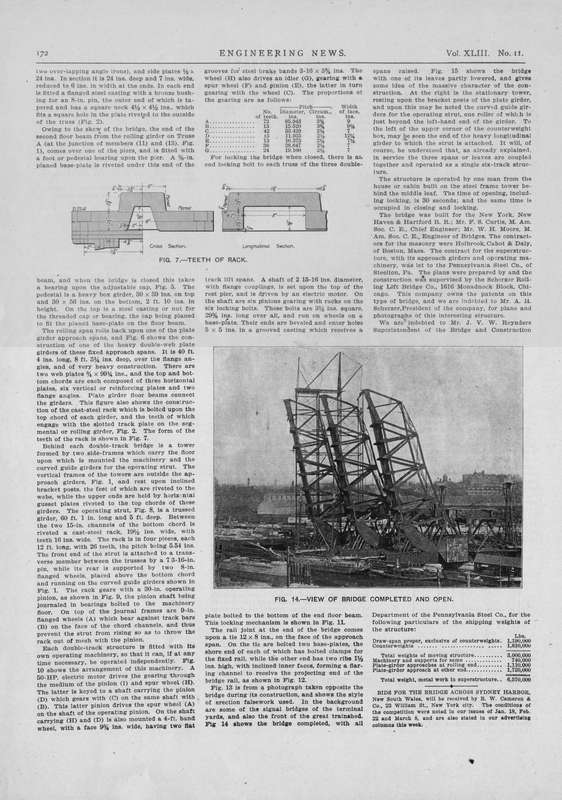 Starting on page 451, the Journal provides an extensive coverage of these buildings. A copy of this Journal can be found here: Volume XXI of the Transactions of the American Society of Mechanical Engineers. The gullible John Sheridan has carelessly given me the keys to the castle here at The South Station Project. 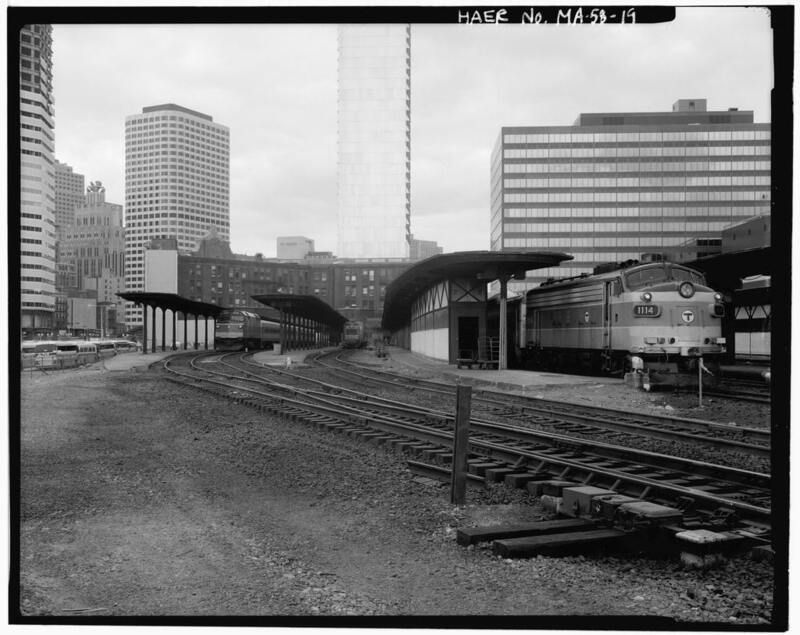 For my first blog post, I'd thought I'd dredge the internet for some South Station photos, showing some of the changes over the years. For this post, all images are from the NERAIL Photo Archive, in chronological order. 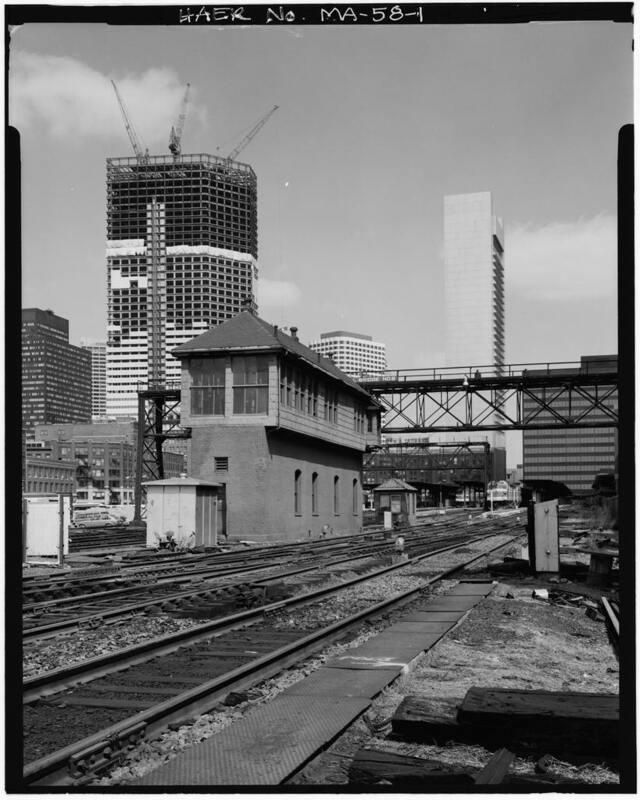 South Station was slowly nibbled away after the station was sold to the Boston Redevelopment Authority in 1965. In fact, it was due to be razed entirely before the preservationist movement saved the day and the station. 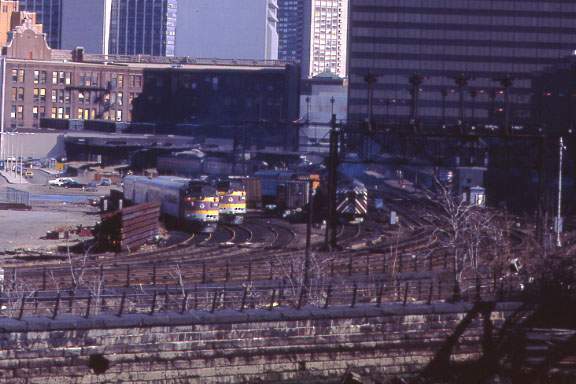 Instead, it was transferred to the MBTA in August, 1979. 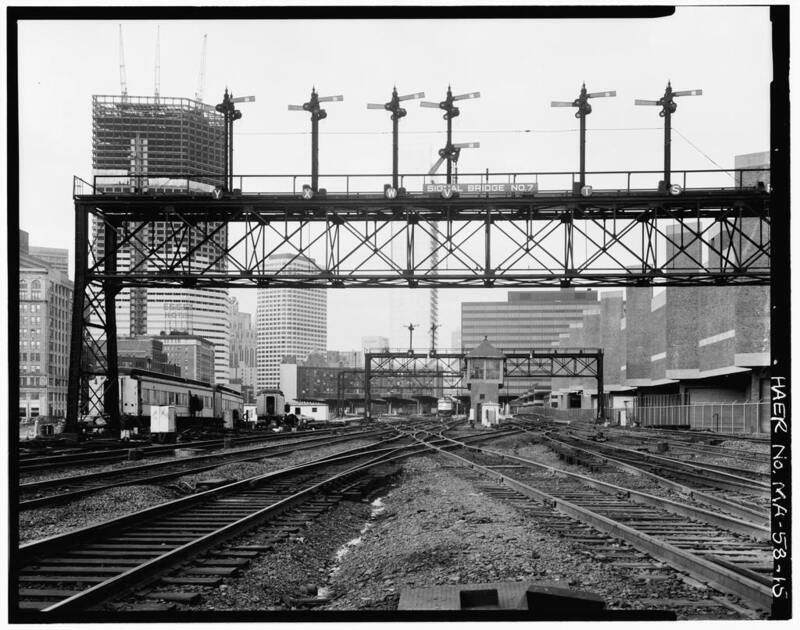 South Station was the subject of a massive reconstruction project in the mid-1980's where they rationalized the track plan for modern trains and fixed up the rest of the headhouse. They actually built a new Atlantic Ave. wing to take place of the old one that was knocked down, even going so far as to re-open the granite quarries from the original contstruction so as to match it perfectly. As we can see above, the USPS brick building is in place, eating up almost half the yard tracks. Also, the Atlantic Ave. wing of the station (on the left) has been cut back already. The high track weeds are a common Penn Central affliction. From Summer St. across Dewey Square, one can see how much of the headhouse is missing. Behind the headhouse on the left is the Stone & Webster building looming over the area. This glass & steel building supplanted around half of the headhouse's square footage. 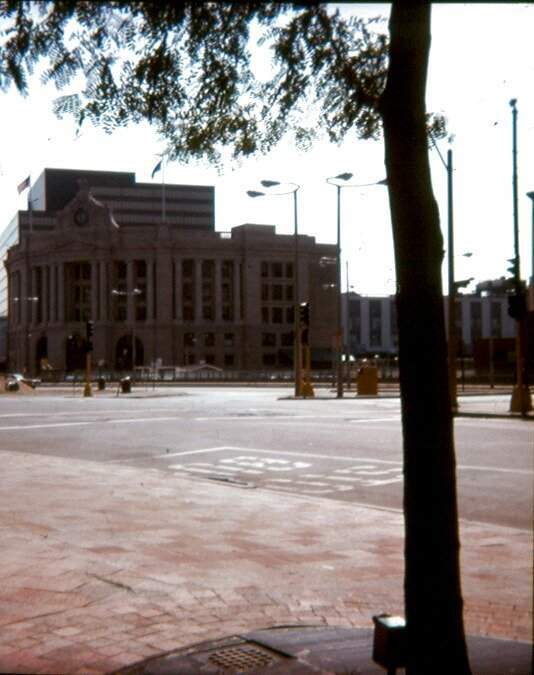 On the right behind the tree, one can see white "columns" of the original USPS South Postal Annex, which was built over the high-numbered tracks. One can see just how big the Stone & Webster building is on the right, and the new Boston Federal building (the washboard) is in the background. Pretty amazing how much the city skyline changed from the above 1973 picture. A rare shot of the 1984-1988 reconstruction project. 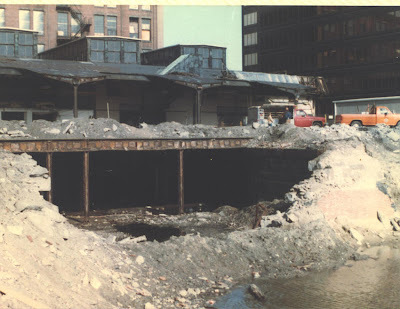 This is the underground commuter station that was never used. The roof monitors are for the Midway, and one can see the old butterfly shed supports at the roof edge. The entire area above the underground tunnel was covered with a corrigated metal deck, some of which is visible here as a pattern on the beam between the levels. More during the reconstruction project, showing that the lower numbered tracks are out of service and the butterfly sheds & Midway are gone. All the windows are boarded up, and from personal memory, the inside wasn't much better. A fire at the Club Car bar didn't help, either. I just remember as a kid lots of pigeons, plywood, and grime. Almost done, with only a small pile of rubble visible on the right. The new highlevel platforms are in place, along with the new waiting room taking the place of the old Midway.